Do you ever feel disconnected from Nature? Like human civilization is taking over more and more, threatening life on the Earth? That there is an urgent need to change? We invite you to come to a beautiful land to take time to be present with Nature. Together we will reconnect with the Earth, with each other, and the callings of our hearts. We will create space for our responses towards the state of the world and find ways to move forward that give us energy. If we look around in the world it might seem are surrounded by asphalt, a system that is a threat to all life on earth. But under this carpet of civilization, the earth remains alive, as does our love for life. We come together to tap into our deeps roots and feel our ever-present connection with earth. Through this we will strengthen our capacity and courage to work for a regenerative and resilient human presence in the world. The challenges we are facing in this time are overwhelming. With so much destruction of the earth, many feel despair. We feel this pain because of our deep interconnection with the web of life. This weekend we honor our despair as a healthy alarm signal and we will practice re-rooting ourselves in the web of life that is all around us. Even if we often feel disconnected with earth, we will notice this weekend that the earth is always with us. Through practical exercises we can feel the earth and through that connection receive guidance. These experiences ground and strengthen our capacity to work for resilience. We will learn ways to respond to the crises at hand, which will empower us to move us forward to transition. Valerie from the U.S. is here to share her experience living wild. She has spent 9 of the last 12 months living in wild places from the gifts of the earth. 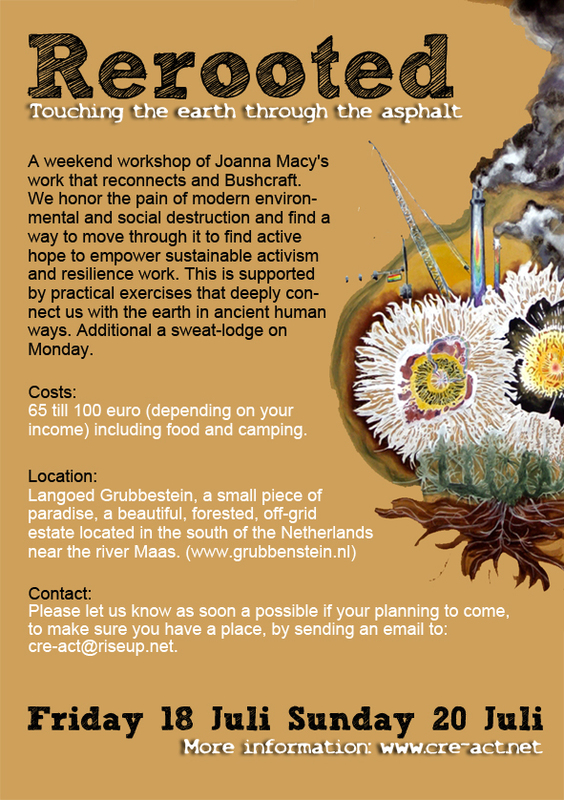 Mara is very experienced in giving inter-active workshops; her main focus is supporting sustainable activism using the work of Joanna Macy. They met each other in 2011 during the Gaia Education Eco-village Design course in Findhorn. Now they want to bring together their skills and share with you through this uniquely developed program. 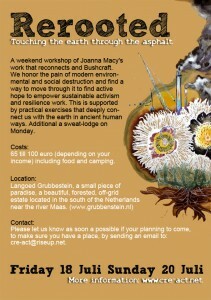 Friday from 17.00 till Sunday 16.00 with the option to stay till Monday for a sweat-lodge ceremony. We will sleep in our own tents and there will be biological (organic) and vegan food. To cover the location costs and food, we ask minimal 60 euro’s, more donations are welcome. (If the price is a problem, but you would love to join, than please write us an email.) Everyone is welcome to stay until Monday to join a sweat lodge ceremony , there will be extra costs for this. The language of the weekend will be mainly English. Please let us know before 10th July if your planning to come, to make sure you have a place, by sending an mail to: cre-act(at)riseup.net. Write us also if your thinking/doubting to come or have any questions.